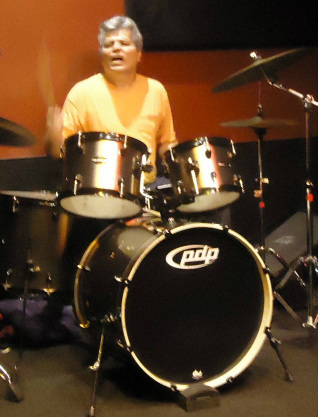 Robert Martorella﻿ has been playing drums since he was 13. He studied with the late, great Joe Morello, drummer for Dave Brubeck and Ed Burroughs, who wrote many of the books all serious drummers study from. Bob, himself, is a revered drum teacher. To simply state that Robert has had a distinguished musical career is an understatement. His first gig landed him as drummer for the extremely funky "Soul Incorporated" with the then already famous Jaco Pastorius. He went on to drum for Ashford and Simpson, K.C. and the Sunshine Band, the O'Jay's, Wayne Cochran and the C.C. Riders, George McCrae, funkmaster Jimmy Bo Horne and The Sugar Hill Gang. But Bob's strongest suit is still Rock music. Nobody drives any band harder. The fact that he's played so much funk just makes him even more versatile. Bob plays with a rock solid foot and a killer back beat. Simply put: funk meets rock = one seriously amazing drummer.